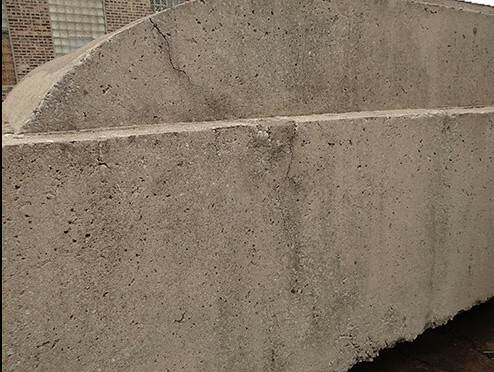 Our project has focused on a material investigation and conservation proposal for Wolf Vostell’s Concrete Traffic (1970), a monumental sculpture of great art historical significance that is part of the University of Chicago’s Campus Art Collection. This project has brought New York-based conservator Christian Scheidemann to the UChicago campus for a series of engagements with a growing number of local scholars interested in the materials of modern and contemporary art, along with invited experts in materials science, engineering, automobile restoration, and conservation science. Through a series of workshops, along with extensive archival research and oral histories, we have proposed a conservation treatment for the largest extant Fluxus objects in the world. A project of the Neubauer Collegium for Culture and Society, in partnership with the Richard and Mary L. Gray Center for Arts and Inquiry. Concrete Traffic is a large-scale outdoor public sculpture consisting of a 1957 Cadillac, which, save for its undercarriage and whitewall rubber tires, is encased in several tons of concrete. Conceived by the German Fluxus artist Wolf Vostell (1932-1998) as an “instant happening” and an “event sculpture,” Concrete Traffic was commissioned by the Museum of Contemporary Art in Chicago (MCA) under its first director, Jan van der Marck. Over the course of several weeks in late December 1969 and into January 1970, local artisans made the molds for the sculpture according to the artist’s instructions. On January 16, 1970, during the morning commute, local contractors poured concrete into the molds of the sculpture, in the middle of an active parking lot on Ontario Street at North St. Clair near the original MCA building. Several days later, the molds were removed, revealing a monumental concrete sculpture bearing the contours of the Cadillac embedded within. Given several months of parking fees along with the MCA’s status at the time as a non-collecting institution, the artist and the museum gifted the sculpture to the University of Chicago. On June 13, 1970, construction crews transported the sculpture via a flatbed truck to its new location just outside the University’s Midway Studios, at the southern side of 60th Street, near Ingleside Avenue. The sculpture remained in this location for nearly 40 years, when on May 30, 2009 it was moved to make way for the construction of the Reva and David Logan Center for the Arts. Since 2009, the sculpture has been stored at a facility managed by Methods and Materials, specialist in large-scale fine art rigging and installation, located in the Humboldt Park neighborhood of Chicago. On April 29, 2015, Robert J. Zimmer, President of the University of Chicago, approved a new home for the sculpture on the University’s campus, in the University’s main parking garage situated between Ellis and Greenwood Avenues and 55th Street, adjacent to the Department of Art History and the David and Alfred Smart Museum of Art. Zimmer’s decision has now made it possible for conservation work to move forward. The original German term is Ereignisskulptur. Wolf Vostell and Ulrike Rüdiger, Vostell: Leben=Kunst=Leben: Werke 1953–1993 [Vostell: Life=Art=Life: Works 1953-1993] (Leipzig: E. A. Seemann, 1993), 246. Wolf Vostell, Wolf Vostell: mon art est la résistance éternelle à la mort / my art is the eternal resistance to death (Nîmes: Carré d'Art-Musée d'art contemporain de Nîmes, 2008), 142. Concrete Traffic exemplifies the dilemma of public art, caught between desiring urban contexts and broad audiences on the one hand, and being subjected to environmental exposure and possible vandalism on the other. However, the work’s unique acquisition history has compounded the effects of nature and time. When the sculpture was given to the University in 1970, the official University museum, the Smart Museum of Art, had not yet been established. As a result, the sculpture was exempt from formal maintenance or conservation treatments and the changing condition of the materials had never been monitored, prior to four years ago. This has resulted in significant and challenging condition problems. It also nearly resulted in the sculpture having been demolished when its original campus site was cleared for the construction of the Logan Center. The identification of the sculpture as a significant artwork by Christine Mehring, Chair and Professor of the Department of Art History, saved it from being sold or disposed of, as had been suggested in 2008 when it was moved as part of the development of the center. Thereafter, the sculpture was recognized as a part of the University of Chicago’s Campus Art Collection. For additional information on Project History, please continue to sections below. Judith Simon (Methods and Materials), conversation with Christine Mehring, November 2011; Elly Fishman, “Out in the cold: What will the University of Chicago do with its deteriorating Public Art?” Chicago Weekly (30 April 2009), accessed 23 August 2013. At this time, conservation efforts are urgently needed to prevent the sculpture from deteriorating at its current rate. Since our investigation began, and especially over the past year, we have documented significant changes to the concrete surface and structure of the sculpture, including losses from concrete falling off, and downward pressure upon the tires from the sculpture’s failing support structure causing the sculpture to tilt. If left untreated, the sculpture will inevitably crack and collapse catastrophically. The conservation study has encompassed the ongoing thorough examination and documentation of the sculpture’s current and historic condition, identification of the materials and their deterioration through technical research, determination of the proper approaches to structurally support the sculpture and preserve its materials and aesthetic appearance, implementation of those measures, and finally, the development of long-term preservation strategies to ensure the sculpture’s longevity. 1957 Cadillac DeVille, Model 6239 – The undercarriage of the car and the tires are exposed to the elements. The chassis of the car is severely corroded, with original protective coatings flaking, and elements such as the exhaust pipe detaching. The rubber tires are cracking deeply and no longer appear inflated as they did in the original installation. Concrete – Several tons of concrete were poured around the car into a temporary mold. The concrete is now cracking and scaling severely. In addition, in 1970, shortly after the mold was removed and before the sculpture moved to the University of Chicago, someone other than the artist or the original fabricator patched two areas where the concrete did not completely fill the mold with a visibly different compound. These patches are inconsistent with the artist’s handling of patches in related works like Ruhender Verkehr. Biological growth has further marred the surface appearance of the sculpture. Internal Metal Structures – Inside the concrete are reinforcing bars and a steel mesh that provide the concrete with internal support and stabilization. Additionally, there are steel angles around the circumference of the lower edge of the concrete that are attached internally to the steel mesh. Exposed on the underside, the angles exhibit severe corrosion. The expansion of the corrosion products is adding pressure to the concrete in these areas and is one of the likely causes of the cracking. 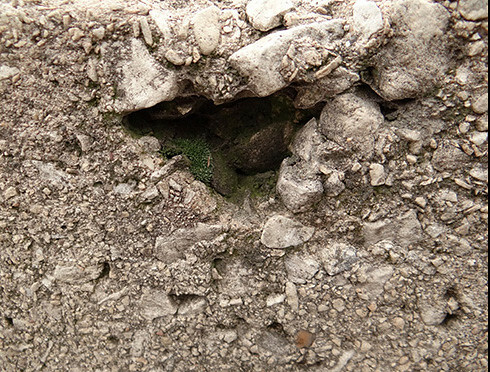 The condition of the internal bars and mesh is unknown; however the cracks in the concrete have allowed water to pass through, thereby potentially causing additional corrosion. I-Beam Supports – During the relocation of the sculpture from the MCA to the University of Chicago, two metal I-beams were fixed to the underside of the sculpture, enabling it to be lifted and transported. Once the sculpture was installed, the I-beams were cut off at their ends but not removed. When the sculpture was moved to storage, wooden planks were further added as resting points for the I-Beams. As a result, the weight-bearing points for the sculpture that originally were distributed through the X-frame of the car have shifted. Moreover, the sculpture now sits at a greater distance off the ground than it originally did. The I-beams are not only visually distracting to the overall aesthetic of the work, but are also detrimental to the concrete as exhibited by concentrated areas of loss around the points of contact between the beams and the concrete. Remnant Mold Forms – On January 22, 1970, preparators at the MCA removed the wooden molds that formed the sculpture. However, fragments of the mold underneath the sculpture have remained wedged in place for forty-five years. While some of these wooden elements are sound and solidly in place, some have loosened and are deteriorating. The latter will be assessed for removal or treatment if deemed necessary for the longevity of the sculpture. To date, we have completed several steps in documenting the sculpture and its condition by experts in the fields of art conservation and historic preservation. 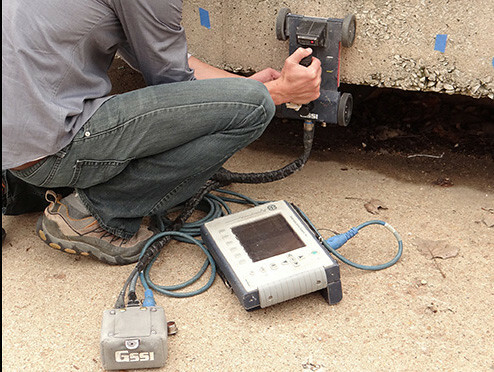 Wiss, Janney, Elstner (WJE) conducted Ground Penetrating Radar (GPR) to roughly determine the location and condition of the sculpture’s underlying metals, including both the rebar and mesh within the concrete, as well as the automobile. Stephen Kelley, a structural engineer with expertise in historic structures, in collaboration with Scheidemann and Stephen Murphy, Curator and Restoration Specialist at Chicago Vintage Motor Carriage, has begun a full structural analysis of the sculpture. We have also performed a complete photographic documentation of the underside of the car. 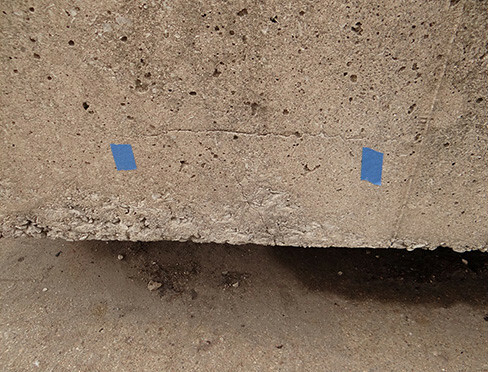 Amanda Trienens, a concrete conservator, has provided a full visual documentation of the concrete, identifying areas in risk of fracture and other treatable cracks, along with evidence of chemical destabilization and other surface concerns. 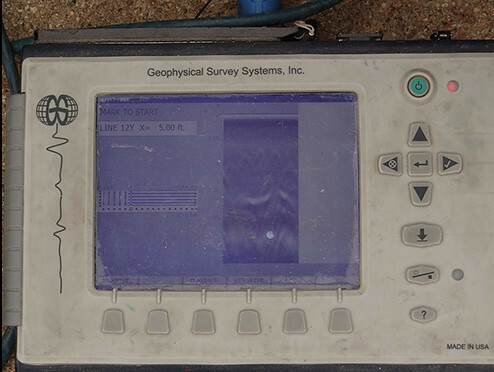 We have conducted petrographic analysis on one sample, and will test an additional sample in the coming months to establish a baseline for the physical and chemical composition of the concrete, inform further treatments and risk factors, and provide us with the ingredients needed to generate a matching concrete mixture for any necessary fills. In order to save this important sculpture, Mehring has since summer 2011 brought together an extraordinary team of experts to help address the sculpture’s complex facets. In conjunction with the pro-bono consulting of Christian Scheidemann, an internationally renowned conservator of contemporary art specializing in art made from non-traditional materials, the core team now includes, among others, a concrete conservation specialist, the newly appointed Campus Art and Artifacts Coordinator who is an objects conservator with experience conserving large-scale machinery, a vintage auto-mechanic, a conservator from the University’s Oriental Institute, and two structural engineers. The conservation team has also greatly benefited from the input of James O’Hara, a former MCA employee and the original fabricator of the sculpture. In addition, an advisory panel has been established consisting of nationally recognized scholars and scientists and University administrative staff, including Fluxus scholars Hannah Higgins and Jacob Proctor (also Curator of Neubauer Collegium Exhibitions), American Literature and Culture scholar Bill Brown (since last fall Deputy Provost for the Arts), Bill Michel (Executive Director of the Logan Center), the internationally renowned sculptor Jessica Stockholder (also Professor and Chair in the Department of Visual Arts), and Matthew Tirrell, a leading molecular engineer (and Founding Pritzker Director of the Institute for Molecular Engineering). All along the team has worked closely with staff in the Provost’s and President’s Offices. Between June 2012 and April 2015, Mehring coordinated a series of four multi-day workshops that brought together the above team members and experts, University administrative staff, and graduate and undergraduate students, to present on and discuss the history of the sculpture and its importance, the details of its original fabrication, necessary conservation measures, and potential future siting. Conservation measures are essential to preserving the art-historical significance of Concrete Traffic. In its use and combination of non-traditional unusual materials, Concrete Traffic forms one of the most paradigmatic yet challenging examples of 20th century art. The sculpture’s meaning wholly depends upon the readability of its materials and mode of production. With respect to materials, the particular concrete visibly reads as a period compound that, given its nature as an outdoor sculpture, places the work in dialogue with the same material’s iconic status in mid-century architecture and urban development in the United States, especially in Chicago and in mid-century postwar reconstruction in Western Europe, especially in Germany. In fact, the particular car the German artist chose (a then 13-year-old Cadillac DeVille) and transformed (with the help of Chicago-based artists and workers) embodies the transatlantic, collaborative ambitions of Fluxus that helped shape today’s global art world, as well as the fascination of postwar West German youth with the United States (with American cars, travel, cities, and scale) that preceded more multi-directional global networks of the present. That transatlantic dialogue is literally manifest to this day in the co-existence of Concrete Traffic in Chicago and Ruhender Verkehr (Stationary Traffic) in Cologne, Germany; Vostell created that precedent in October 1969 by casting in concrete an Opel Kapitän, an artwork today in the collection of the Museum Ludwig and prominently “parked” on Hohenzollernring in the city’s center. As an “event sculpture,” Concrete Traffic records its process of transformation—an act of embalming that not only visibly preserves the car beneath and the material traces of the work’s production but also the original shock experienced by bystanders present at the casting event. Extremely rare amongst Fluxus work—a performance-based art movement typically represented by more ephemeral artifacts like fliers, photographs, and film documents—Concrete Traffic to this day allows for an actual experience of the provocative effects central to long-past Fluxus performances and marks a transitional phase in the artist’s career from producing accidental happening “fallouts” to conceptually designed formal sculptures. The sculpture also holds significance for the city of Chicago. For one, its dialogue with modern architectural design and urban renewal establishes the sculpture as a quintessential artwork in and about this city as the world’s greatest “museum” of modern architecture and urbanism. Moreover, it is an integral part of what arguably forms the most significant if perhaps underappreciated gathering of public art in any American city. At a moment when the University of Chicago seeks to expand the quantity and quality of its relations with local art institutions, the sculpture further marks an early collaboration between the University and the then newly established Museum of Contemporary Art, which had opened its doors only three years prior, in 1967. Vostell’s Concrete Traffic was one of the final events overseen by the Museum’s first director, Jan van der Marck. In addition to the documentation and technical research that have been performed previously, a treatment plan has been developed with certain aspects of treatment currently underway. Trienens has performed an initial stabilization treatment of structural cracks and loose components to ensure a reduction of water ingress into the sculpture, and also to ensure the stability of the sculpture as additional work is conducted. She has also performed the initial cleaning of the exterior surface of the concrete to remove biological growth, visible as broad patches of discoloration. Recently, the failing wooden planks, originally intended to support the structure for a short period of time during storage, were replaced with more stable planks to reduce pressure on the wheels that had begun to deform under the sculpture’s weight. Currently, our structural engineers, in consultation with Murphy and the rest of the team, are designing a new support structure for the sculpture. The next steps in our conservation efforts include lifting the sculpture off of the ground to allow the underside to be stabilized and treated. The conservation plan for the underside includes additional thorough visual and written documentation of the sculpture’s fabrication, the interior of the concrete shell, and the automobile; treatments include removing bulk rust from the metal angles to prevent further concrete cracking and conserving the original metalwork and coatings of the car’s underside components. In order to do so, Roger Machin of Methods and Materials has designed, and is in the process of building, a large sawhorse structure to enable the sculpture to be elevated safely and sufficiently off of the ground. At this stage, the new support structure will be built and then installed under the sculpture. Trienens will then stabilize the sensitive concrete surface to preserve the subtle marks of the process of the sculpture’s making, including streaks evidencing the concrete being distributed and imprints left by the mold. Once this work is completed, the future site for the sculpture in the parking garage at the University of Chicago will be prepared, with its current structure reinforced for the installation. University Facilities is presently studying the precise structural needs of the garage with internal and external structural engineers in collaboration with the structural engineers on this project. The sculpture will then be transported back to campus and reinstalled where the final stages of conservation will be implemented. At that point, the team will assess the previous repair patches and decide whether new patches should be fabricated in their place based on the visual appearance and aesthetic integrity of the whole. In addition, Trienens will apply protective measures like waterproofing agents to ensure long-term stability and ease of maintenance. In its new location and for the first time since it left its original location at the MCA, Concrete Traffic will finally uphold the intentions of the artist: sited where a real car could be and amidst real cars. Positioned last in a line of cars parked inside the garage from South to North, the sculpture will be close to active traffic flow entering and leaving the garage from Greenwood Avenue. Further in keeping with art historical considerations, the sculpture will be an active part of everyday public life for people parking their cars and those walking by the entrance. The number of people encountering the sculpture will be significant. Not only is the garage the main parking structure on campus; its Greenwood façade also faces the new North Campus residence hall designed by Jeanne Gang to house 800 students starting in fall 2016 and to be accompanied by substantial landscaping on grounds gained by the transformation of Greenwood Avenue into a dead end just past the garage entrance. From a conservation perspective, the sculpture will no longer be exposed to rain and snow, nor to salt and plowing, nor to any organic matter from trees and the like. Its semi-public and lit setting will minimize vandalism attempts. Investment made in its conservation now—conservation that addresses the damage caused by the improperly added structural support but also from being exposed to the elements—will not need to be repeated in the foreseeable future. The site’s proximity to the Smart Museum will further allow for professional and responsible monitoring of its condition on a regular basis. From an educational perspective, this prime location will also greatly augment the visitor experience of the Smart Museum, especially for those seeking examples of contemporary art. The site’s proximity to the University’s Art History Department will make it readily available for the over 1000 students taught yearly in art history-based core-curriculum college classes. To announce and celebrate the return of this remarkable monumental sculpture, we will host a series of University-wide exhibitions, programs and events during the 2016-2017 academic year in collaboration with the Smart Museum of Art, the Neubauer Collegium for Culture and Society, UChicago Arts, and the Department of Art History. Concrete Traffic has already proven a catalyst for change at the University of Chicago. Since its rediscovery by Mehring, the sculpture was recognized as a key part of the University of Chicago’s Campus Art Collection. In 2011, with the support by then Deputy Provost for the Arts, Larry Norman, along with Logan Center Director, Bill Michel and University Architect, Steve Wiesenthal, Mehring, together with Jessica Stockholder, formed a Taskforce on Campus Art Works, which in 2014 was converted into a committee advising the Provost on a curatorial vision and maintenance and acquisition policies for the University’s public art collection. Then, in 2012, the Provost’s Office created the position of Campus Art Coordinator, previously held part-time by Alice Kain, and since December 1, 2014 held full-time by Anna Weiss, an objects and sculpture conservator. Thus, the conservation of Concrete Traffic will set a critical example at a critical moment for professional custodianship for the University’s public sculptures and create awareness throughout the campus community of the complexity and urgency of conservation issues. Besides providing a model for the care and display of public art on campus, the sculpture, together with Henry Moore’s landmark Nuclear Energy (1967), will bring international attention to the campus as a destination for public sculpture. Yet like that more well-known Moore sculpture, Concrete Traffic will also serve as a quintessential example for the intellectual and aesthetic engagement that the University’s public art stands to offer amidst local everyday life, not only to students outside of the classroom but also to surrounding South Side communities and schools. To facilitate this engagement of international and local audiences, Mehring and Bill Michel have developed a website for Public Art on Campus with content being developed by students in Mehring’s seminar on “Public Sculpture,” taught in spring 2015 and again in 2016. Mehring and Michel have also partnered with the non-profit organization Chicago Public Art to include the University’s public art in the mobile app that their staff has developed to allow users to locate and learn about individual artworks and to put together personalized tours in specific neighborhoods like Hyde Park. Once re-installed on campus, Concrete Traffic will reach a significant public audience. The sculpture will be activated through a year-long series of diverse and dynamic programming that promises to engage culture seekers of all ages interested in learning more about the use of non-traditional art materials in modern and contemporary art and the challenges posed by their conservation, as well as the history of this specific work’s fabrication and its connections to the history of Chicago and to an influential international art movement. Concrete Traffic will serve as a model for how the University’s public art collection—activated in exciting new ways—can make high-quality art more accessible on Chicago’s South Side. Rebecca Mead, "The Art Doctor: How do you restore works made with latex, caviar, or elephant dung?"